I keep trying to think of things I can say here that will somehow make sense of this game. I keep writing paragraphs and then deleting them and starting over. The truth is, there is now way to somehow draw any real sense of reason and covey it in a way that makes any sense. All that really matters from yesterday is that Michigan won the game. That's it. Period. On their last drive to win the game, Michigan ran 4 plays for 70 yards and scored in 1:21. When backed up against the wall, Michigan did just enough to win the game. They scored when they had to, and made stops when they had to. Was it ugly? Yes. Did Michigan hurt themselves with turnovers and sloppy play? Yes. Was Michigan adequately prepared for Akron? No. Was Akron really good enough to beat Michigan yesterday? No. If they were, they would've. Michigan opened almost every door for them along the way, and still won the game. That, in and of itself, shouldn't be discounted. What does this mean going forward? Well, that's the real question, isn't it? We heard in the post-game all of the promises from coaches and players that this will never happen again. Seems like every year Michigan has a terrible game where someone feels compelled to come out and make such promises. 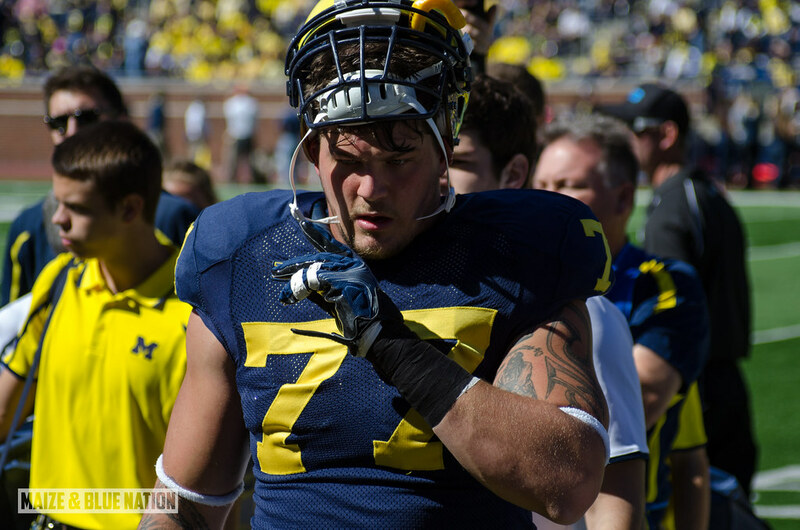 Taylor Lewan put the blame on himself for the lack of preparation by the offense. Of course, I have a tough time believing that it was all on Lewan, as much of the offense struggled. And of course, the defense, which has 3 captains, struggled as well. Did the whole team just have an off day? I don't think so. I think the turnovers killed some drives and some momentum, which kept Akron alive. And of course the longer you keep Akron alive, they stronger and better they become. This isn't an uncommon story. It happens all the time to teams all over the country. You take a team for granted, you come out flat and don't play very sharp, they hang around, and eventually you've got a game on your hands. And once it gets to that point, its far more mental than physical. Momentum is the key to college football. Maybe Akron will serve as a huge wake up call for this program. Not that Michigan needs one as horrible thoughts of Appalachian State and Toledo raced through the minds of every Michigan fan as the 4th quarter inched away. But under Hoke, Michigan hasn't played a game like this. They haven't had a "wake up" call. Thankfully, this one was still a victory...but it felt like a loss. And maybe that's the difference between "old Michigan" and this Michigan. Wake up calls are no longer catastrophic, historic, soul-crushing losses. But rather, narrow wins against MAC schools. So how does Michigan learn from this and move ahead? It all starts in practice. Michigan played very good games against Central Michigan and Notre Dame. We know this team is much better then what they showed yesterday. The key is mental toughness and not losing focus. Don't take anyone for granted. Of course, time will tell. UConn is next.